Kirito fights Administrator for the future of Under World as his body in the real world is endangered by unknown forces. Season Hiatus. Episode 24 - "My Hero"
With an episode title like "My Hero," we could only be talking about one person. Yeah, Mr. Dual Wielder himself gets to do just that. It's also a fine time for a narrative break since we're going on a six month break between seasons. The next 24 or so episodes will continue in October. The fighting conversation between Administrator and Kirito really laid out how much the real world has been intruding into the fluctlight space too. She knew about the different sword techniques from Alfheim and Aincrad. She even taunted Kirito by using skills that Asuna and Yuuki used. These appear to be big hints about who "that person" Administrator was talking to all this time. I have questions about whether Administrator really made it out or not. The scene where she looked over the Realm of Humanity before she disappeared implied that fiery Chudelkin ended up killing her before she left the game, but until we see that golden puff of dust, we really can't be sure. 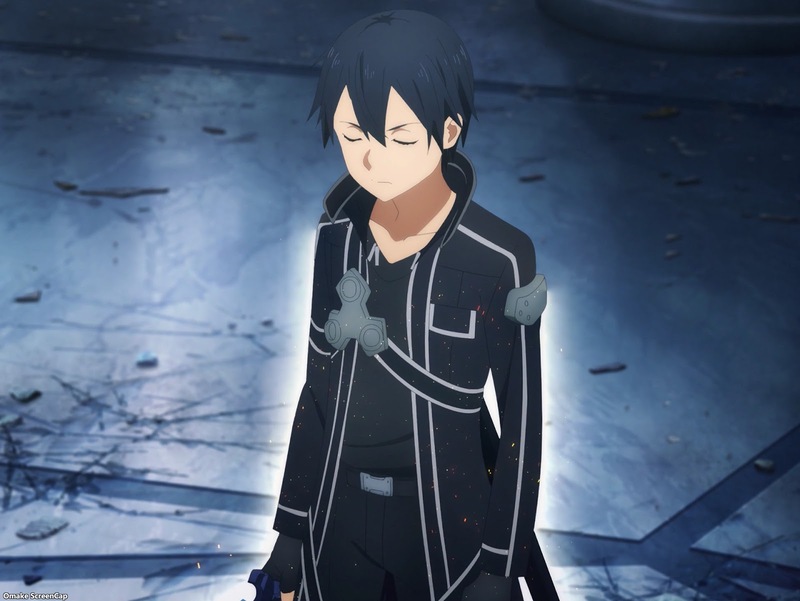 Speaking of making it out or not, I suspect that Kirito was forcefully ejected from the game by that power surge. I'm an anime only consumer of this story, so I don't know what the source material says, but as a narrative device fitting the broadcast schedule, this works out nicely. 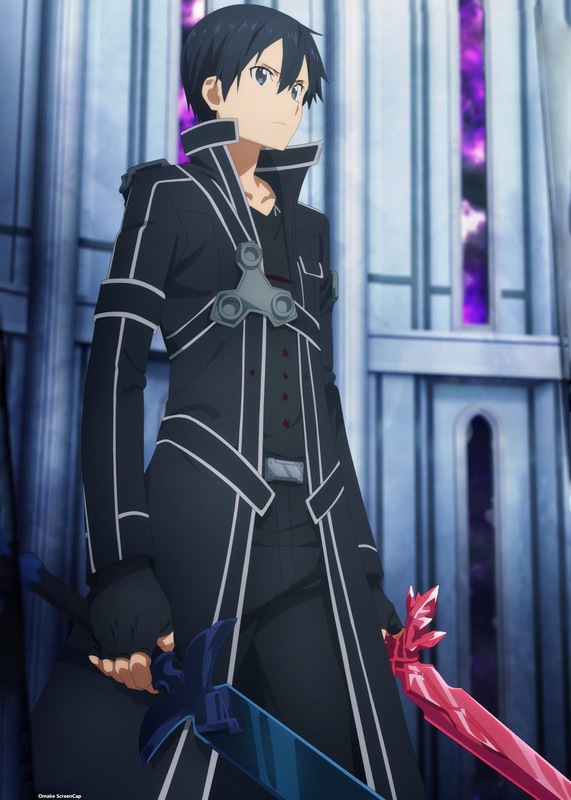 Kikuoka would have reset the game to 1K speed as Kirito ended the console chat, and if Kirito was successfully put back into his repaired neural network, then that would leave a convenient time skip for the Hero to jump back into. It lets Kirito mess with whatever is going on with Rath, the invasion, and possible murderbots. It also lets Alice deal with a world without a pontifex, without a working Taboo Index, and Dark Territory incursions as they prepare for their big invasion. That's how I would tell the story, at least. I have a couple of points about Eugeo and the original Alice leaving the story. I liked how Eugeo was able to relive the original memory that Quinella had used on him to turn him into a Synthesis. Just look at how cruel Quinella was to use a memory from the original Alice that included young Kirito, when Eugeo didn't even remember Kirito as part of his friendship with Alice. It made that yearning even more bitter, plus how she manipulated it to make it seem Alice and Kirito were keeping a secret relationship from him. It was a satisfying resolution to see they were just making his birthday present together. That's just a nice, sweet moment. The other point is seeing Alice and Eugeo branch off from Kirito's journey. 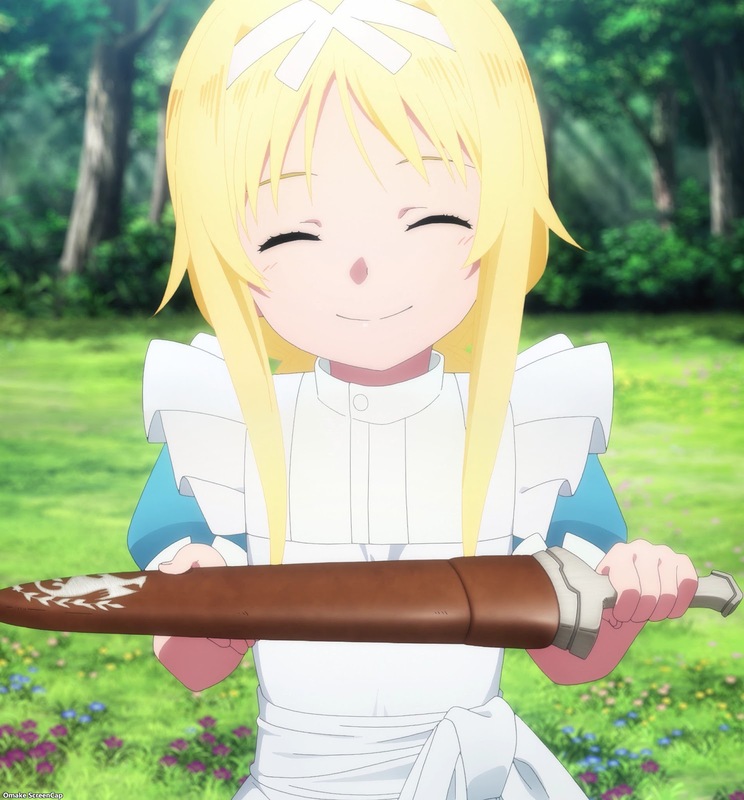 It's more concrete to see it in this circumstance since Eugeo is dying and the original Alice's memories and personality left with him, but it reminded me of the normal course of childhood friends. Kids move away from each other, and the sense of loss feels like a death. And we may see these same people years later, but personalities change in the meantime too, so the person we meet again will be different too, and vice versa. The shock won't be as bad as Alice slapping Eugeo when they're reunited, since Alice was an Integrity Knight, but it's very similar. This brings me to a final point about the hiatus. This story is done with its adolescence. Adult things and violence are going to be happening in the real world before we get back to Under World, but Under World itself will have moved on from its innocence. Not that it ever had any, considering how the nobles treated those below their station, but it's all going to be overt now. I'm hoping for some more slice of life in the second half of the next series of episodes like we had in the second season of the anime. We'll see how that goes. Kirito is going into full Aincrad mode. Administrator knows all the sword skill terms from the other SEED games. She used Asuna's Crucifixion skill and Yuuki's Zekku skill from when she was Zekken in Alfheim. I think she's taunting Kirito. Eugeo's still alive! If there's no golden puff of dust with a fadeaway, no death, apparently. Alice's memories bring Eugeo and Kirito back to the prologue. New sword. Blood Rose Sword? I'll call it that. 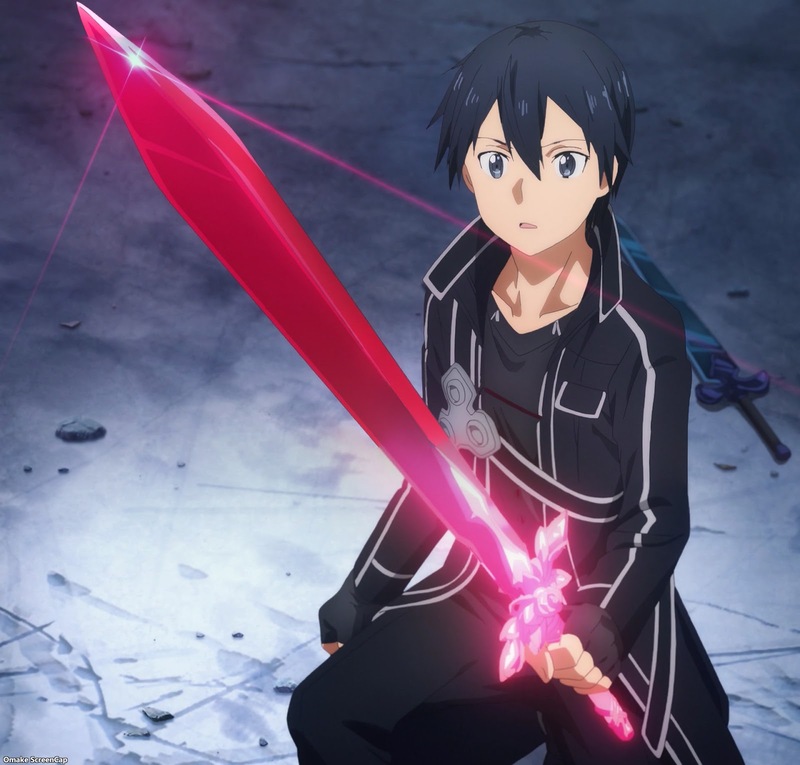 Kirito is Eugeo's Hero, from the episode title. Yes, yes he is. Dual wielding, here we go! Kirito gave up an arm, but Administrator gave up her other arm, so game over? Ah. Not game over yet. Hair attack! Well, that did it. Now we're watching a Bleach episode. What a way to ruin the best chest in the game. Quinella is too hurt to heal, so she's going to bounce. Ta ta. Ha. She's typing on the in-game console with her hair. I hope we find out where she was going to go. She's saying stuff without sound. I hope we find out what that was at some point. If it wasn't important, they wouldn't show it, right? Chudelkin is still burning and yearning. Ugh! Did they really survive long enough to get out of the game? That scene with Quinella looking over the human realm implies not so much. 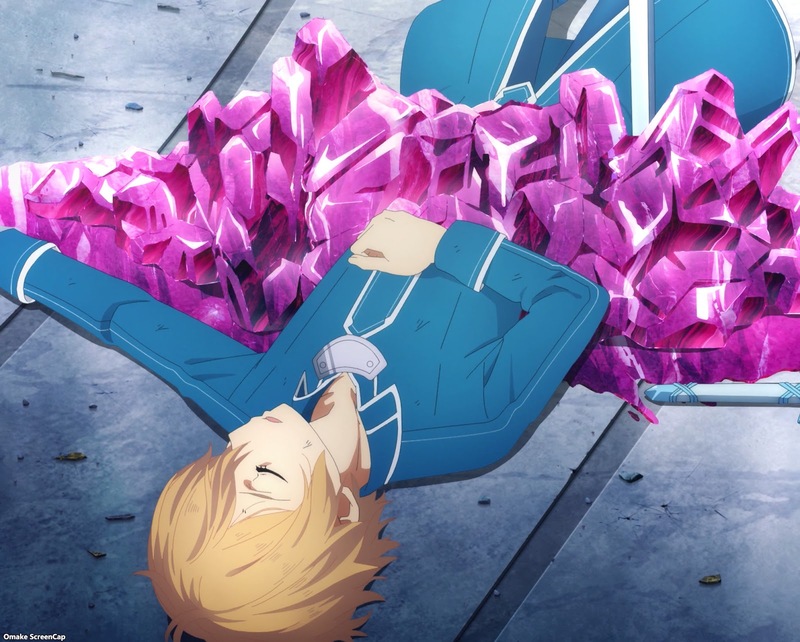 And now Eugeo dies, taking original Alice's memories with him. "Love isn't something you seek; it's something you give." Good for you, Eugeo. Nice. That tainted memory Administrator used with half the context showed that both kids were making Eugeo's birthday present, which is why they were trying to hide it from him. Aw. This is sad. Like realizing childhood friends can't always be together. Closure. 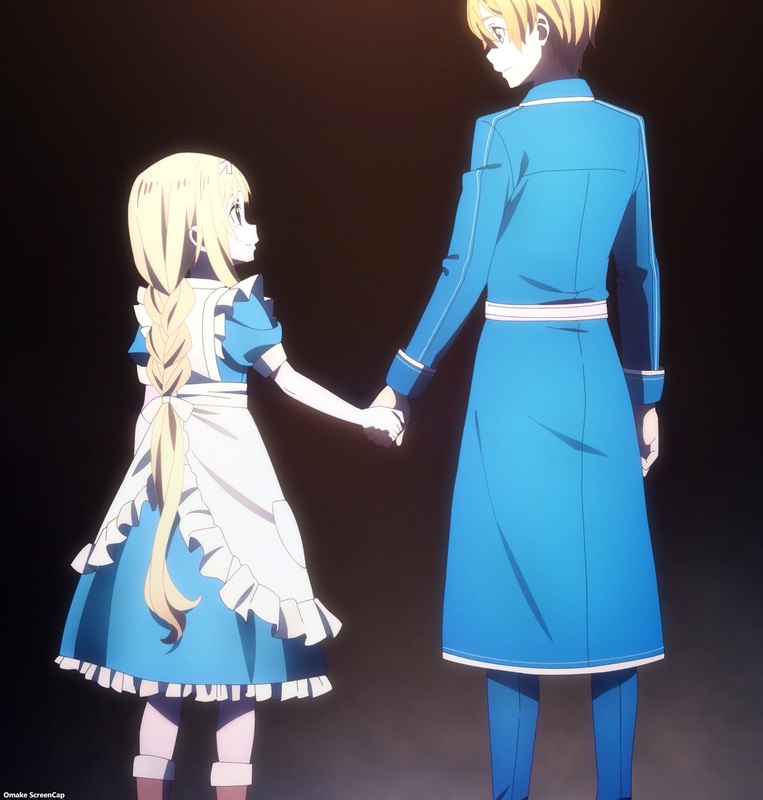 Eugeo was reunited with the Alice he always knew. Mission complete. Now we get to find out what's going on at the Sea Turtle. Full scale military assault. Foreshadowing was done well. Those commandos look like they trained inside GGO. Pay attention to the guy with the face tattoo. 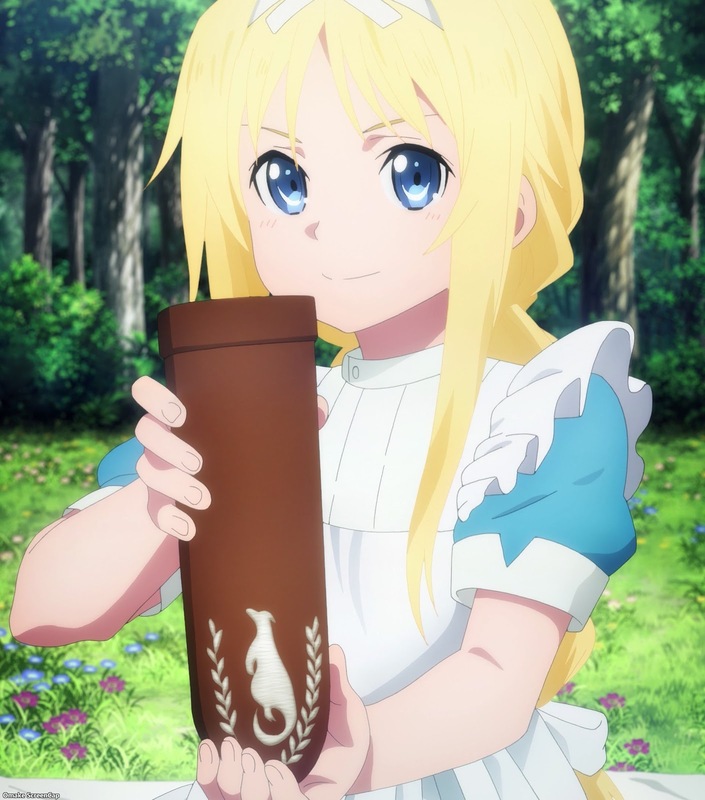 Kikuoka says Kirito needs to bring Alice to World's End Altar. I'm looking at you, part two quest. Is this surge going to trap Kirito in there, or pull him out? I guess we'll find out in October!